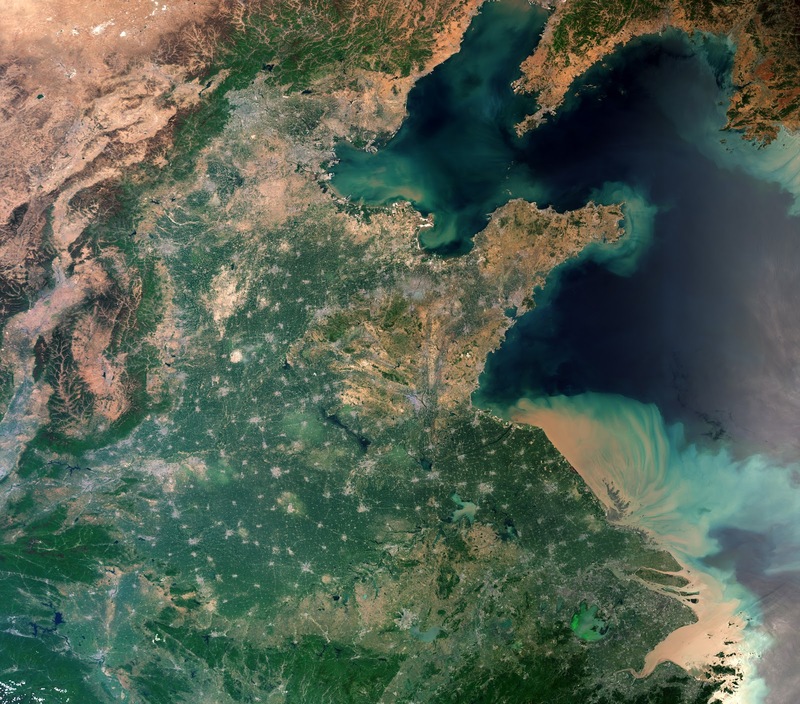 The European Space Agency's Copernicus Sentinel-3A satellite takes us over Shanghai, China. One of the most populous cities in the world and home to over 24 million people, the city is visible in the lower right of the image just above the Yangtze River mouth. As a significant global financial center it is also the site of the world’s busiest container ports because of its strategic location on the Yangtze River delta. The image covers an area of over 1200 km, showing Beijing at the center-top, the salt flats close to the Mongolian border in the top left, and North Korea, with its capital, Pyongyang, just visible in the top right of the image. A large number of urban settlements represented as grey flecks are interspersed with agricultural fields, dominating the central part of the image. This true color image taken using Sentinel-3A’s Ocean and Land Color Instrument (OLCI) shows the huge amount of sediment carried into the ocean along the coast. Meanwhile, Taihu Lake is shown in green in the lower right part of the image. In 2007, an algal bloom on the lake caused major problems with water supplies in the neighboring city of Wuxi. Such algal blooms may well be linked to the discharge of phosphates found in fertilizers used in industry and agriculture into the water. Steps have been taken to limit the use of such fertilizers in a bid to reduce algal blooms, which can significantly alter the ecology of the environment below the surface and pose a threat to various forms of water life. Sentinel-3 is a two-satellite mission to supply the coverage and data delivery needed for Europe’s Copernicus environmental monitoring program. Since 2016, Sentinel-3A has been measuring our oceans, land, ice and atmosphere to monitor and understand large-scale global dynamics and to provide critical information for marine operations, and more. This image which was captured on April 29, 2017, is also featured on the "Earth from Space" video program.